Who doesn’t like dumplings? They are made around the world. Some are boiled, others are baked, and some are fried. The fillings are varied. You can get vegetarian ones or ones filled with meat. Growing up in a Ukrainian family, we had perogies filled with cottage cheese and potatoes, or sauerkraut and potatoes quite often, and they are delicious. I even wrote an article about pairing perogies with Viognier. Here is the article on my perogie and wine pairing! 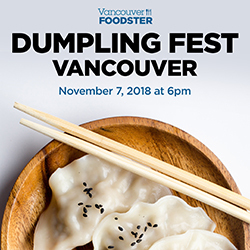 Vancouver Foodster is featuring dumplings in his upcoming Dumpling Fest on Nov. 7. I will be there. I hope you will too. Here is his announcement. 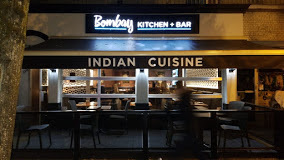 Join us and tantalize your taste buds at several restaurants between Olympic Village, Chinatown and Commercial Drive areas of East Van serving up different kinds of dumplings, from Cantonese soup dumplings, to Russian Pelmeni to Indian Kofta to Korean Mandoo and more. This evening tasting extravaganza is on Wednesday November 7 from 6pm until 10pm and is presented by Vancouver Foodster and Tasting Plates. Each restaurant will be serving up Tasting Plates and Bowls for guests to enjoy and you will have a chance to visit many different types of restaurants throughout the event, meet some new food loving friends, meet the chefs, and learn about each of the participating restaurants. If you haven’t been to our previous Tasting Plates events, Novus TV featured one of our previous events on City Lights (view here). Visit our Tasting Plates site and view our past events, photos and more! Registration: tba – this is where you will show us your printed or digital tickets and will pick up your Dumpling Fest Passports and menus. Since 1972, Hon’s Wonton House, situated in the heart of Vancouver’s Chinatown, has been creating and sharing traditional Asian Comfort Food with customers of all generations. Using rustic, locally sourced ingredients and time-honoured Cantonese recipes, customers can be transported through tastes and aromas back to the infamous and familiar wonton houses of the Guangzhou. From hand-made wontons and Pan fried Potstickers, to well spiced and simmered broths and noodles, Hon’s flavor filled menu will not disappoint. Traditional hand-made dumplings with a delicious twist. Hey, Dumplings! are Pelmeni- a Russian dumpling which means “ear bread”. Stuffed with meat or potato, the basic dumpling is boiled and served with a side of sour cream. But Hey, Dumplings! are more than your basic dumplings. Let’s eat some. Serving authentic Indian cuisine with dishes from the Bombay region of India, with Malai Kofta our Indian dumplings. Note: Eventbrite fee and GST is extra on all tickets purchased online. Ticket price includes tasting plates at each of the participating restaurants throughout the evening. (Beverages are included at some restaurants which will be noted, you are welcome to purchase wine, beer, cocktails or mocktails at each of the participating restaurants). Note: ALL Tickets must be purchased in advance online. All ticket sales are final. No exchanges or refunds; however you are welcome to transfer the ticket to another person for the same event if you notify us at least 48 hours in advance with name (s) of who will be attending in your place. Participating restaurants subject to change. Event produced by CMI Chat Media Inc. This is an all ages event. This entry was posted in food pairing, Vancouver, Vancouver Foodster and tagged chinese, dumpling, Hey Dumplings, Hon's Wonton House, Russian, vancouver, vanfoodster. Bookmark the permalink. Enter your email address to subscribe to the MyWinePal blog and receive notifications of new posts by email. Have You Tried Improv Mondays with Michelle: Fake Stories, Real Improvisers? If you enjoy the short blog articles here about food and upcoming events, please visit the main MyWinePal.com website that has longer articles on wine related events, wine reviews, plus a database of wine tasting notes for you to explore and more! Enjoy wine, food, and travel with Karl MyWinePal. I cover wines from around the world at all price points. I also love to visit restaurants and let you know about the tastiest dishes.